I got to use my big daddy pot! Last week the Dorsita’s participated in Jamie Oliver’s Food Revolution Day, which is all about getting children excited about real food. Turns out that people who cook their own food eat healthier and kids who help choose, grow and cook food are more likely to make healthy choices including eating their vegetables! It makes a lot of common sense; folks who don’t grow up eating certain foods have a much harder time adapting to new tastes and textures as adults. Grown ups might be able to eat spicier, or more unusually flavored foods, with our less sensitive taste buds, but having the expectation that vegetables, fruits, and whole foods are part of a normal diet starts when we are young. 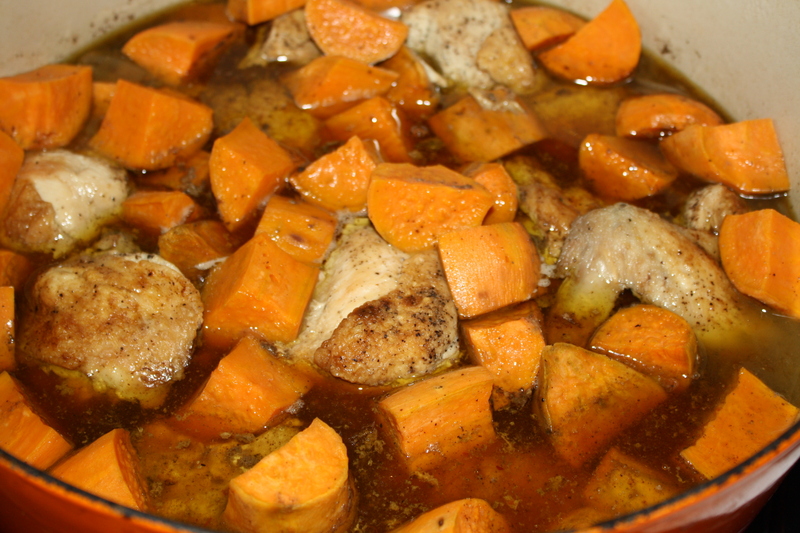 It combines familiar flavors (chicken, onions, sweet potatoes) with possibly new ingredients (saffron, star anise, prunes). There is a lot of history to be learned about Morocco and the influences of many cultures in the dish, including adding ingredients from the New World vs the Old. The the origins and growing of ingredients like saffron, star anise, cinnamon, and sweet potatoes alone would make a great school project. The cutting of onions, peeling and chopping sweet potatoes and slow cooking methods can be applied to every stew or soup they make in the future. Depending on the young person’s age, interest or skill level you can teach boning a chicken, or simply buy one cut up already. Cutting up whole chickens is thrifty and will serve when when they are on their own and making decisions about $. Stews are good ways to use less expensive cuts of meat and stretch ingredients. They can cook for a crowd of their friends and family, while still staying on budget. I made the dish last Friday to be served Saturday night to my co-workers. We were helping to staff a fundraising event over a weekend and thought dinner togehter would be a good way to end the day. 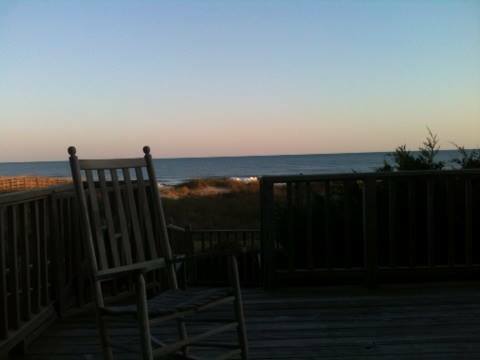 Did I mention the event was at the beach? 🙂 I took a bunch of photos, ate two servings, washed down with some iced margaritas – all with the intent to post a quick blog of the dinner that night – however many margaritas later…I’m a bit late with my posting. A week late to be exact. The tagine was wonderful: the spices slow simmered with the chicken made the house smell like I imagine an Eastern spice market would. Sweet potatoes are a favorite southern food and appealed to most everyone there. The broth was a bit sweet from the prunes and honey, a bit savory from the slow cooked onions that melted into the taste of cinnamon, bay, star anise and saffron. Even D who dislikes cinnamon thought it was good when he dug into the leftovers. We served this with a kale/cabbage salad with a poppy-seed dressing and cooked red quinoa for those who wanted a grain accompaniment. Since 2011, a group of cooks and bloggers have been making their way though all the recipes in Dorie Greenspan’s “Around My French Table.” We don’t publish the recipes, but you can pick up your own copy of the book and cook along, or just enjoy all the great food to be found in its pages. Love to eat, cook, write. Try to think of witty things to say about the world but my thoughts are consumed by food. Mostly. 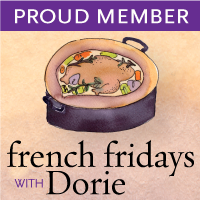 This entry was posted in French Fridays with Dorie, Gluten-free, Low/er Carb, Main Dish and tagged chicken, onion, prunes, saffron, star anise, sweet potato, tagine. Bookmark the permalink. 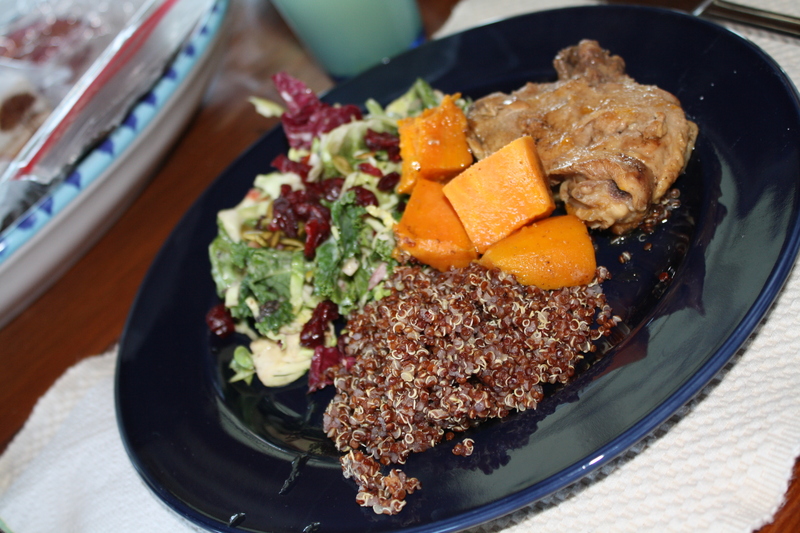 Love the red quinoa you served with the chicken!